Only 16 left in stock - Order today! Quality meets casual. The Riedel Stemless O Wine Glasses are the newest revolution in glassware. Casual yet elegant, these wine glasses are appropriate for fine wine enjoyment, as well as casual sipping. The wine glasses were shaped to fit into a dishwasher and fine-tuned to enhance the pleasure of your favorite wine varietals. In keeping with the Riedel glassware tradition, these wine glasses have become the benchmark for stemless glassware. Machine made in Germany of lead-free crystal. Gift boxed in sets of 2. Dishwasher Safe. Size: 3-5/8"H x 3-1/4" Dia., 20-3/4 oz. 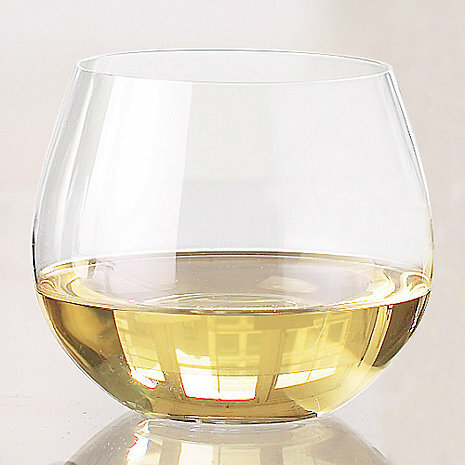 What style of chardonnay is recommended with this glass vs. the other stemless chardonnay glass? BEST ANSWER: Any style of Chardonnay can be enhanced and enjoyed in this glass. Excellent glassware.easy to wash and clean. Dishwasher safe. Bought these for gifts for a couple in our wine tasting group. They loved them. I borrowed them later (best part of giving gifts to good friends -- they let you use them too!). Loved them. These glasses were purchased as a gift and appear to be the perfect item for the upcoming holidays. With family and lots of children the stemless wine glass won't tip over and will be easy to hold as we dodge, duck and dance around with the kids!!! I love these glasses!! Riedel 'O's are for our generation: these are not your mother's wine glasses! We use these all the time during the summer. We had the stemmed Riedel chardonnay glasses from a wine tasting and loved them, but alas, they broke. Stemless glasses are so much more practical, and they work just as well. I swear these glasses make Chardonnay even more delicious. Buy them before they run out. I had trouble finding mine until I hit this website. Would have been 5 stars - believe it enhances the flavor - except for the fact that it is hard to hold in one hand since it is so large in diameter. This is particularly so for people with small hands or a bit of arthritis. Fast shipping and well protected. Arrived in perfect shape....no need for customer service. No stem! For this price, I can set the glass down between sips so the chardonnay doesn't get warm. Comfortable to drink from while laying back in recliner, but the bowl is too big for women with smaller hands. Thin glass which I like. I bought these glasses with high expectations as I was buying them from a wine company. However, the first day upon receiving them one broke when it was lightly tapped by a knife. The glass is much to thin and the quality poor. The only positive thing would be I like the design.